Pacific Mail Steamships "Colorado" and "Senator" at the Pacific Mail docks off South Beach, c. 1880s. Pacific Mail was the backbone of trans-Pacific shipping during the 1860s and 1870s. Not only did Pacific Mail have a guaranteed contract from the U.S. government to carry mail across the seas, they were also the primary carrier of immigrant Chinese labor. Thus, in July, 1877 during three days of riots by unemployed white workers, starting in the sandlots near the then-under construction City Hall, deputized members of the “Pick-Handle Brigade” fought off rioters intent on setting these docks aflame to deter further Chinese immigration. Repelled, the rioters set a nearby lumberyard on fire, probably on Mission Creek. The history of the Pacific Mail Steam Ship Company (PMSSC) (1848-1925) is synonymous with that of San Francisco, where the line was based throughout most of its history. Its history is also synonymous with Gold Rush transportation and with Pacific Basin trade and migrations. Here are some 19th Century lithographs and paintings depicting PMSSC ships, all of which helped contribute to the City's economic and social development. Original lithograph ca. 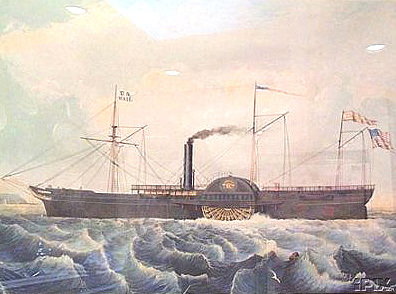 1867 of the wooden side-paddle-wheel steamer "China," built for Pacific Mail's pioneering trans-Pacific route between San Francisco and Yokohama, with service also to Shanghai. Chinese School painting ca. 1874 of US-flagged Pacific Mail steamer "City of Peking" shown in Hong Kong Harbor. (Oil on board.) Hull fragments were found in the mid-1980s in San Francisco during excavations near Candlestick Park. 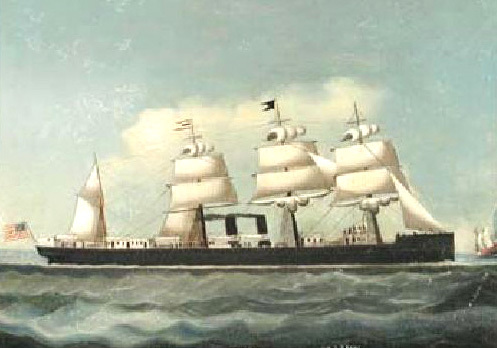 The "Tennessee" was on Pacific Mail's Panama-San Francisco run when she ran aground at Tennessee Cove in Marin County in 1853. This Sarony & Major litho, ca. 1850, belonged to Renee Pierre Schwerin of San Francisco, the company's VP and General Manager in the late 19th Century. 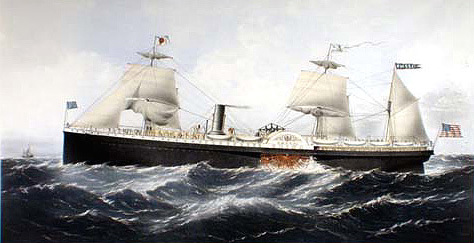 PMSSC was established in 1848 with lucrative U.S. mail contracts, and the first steamship to sail into San Francisco Bay was the PMSSC steamer CALIFORNIA, arriving on February 28, 1849. Here is one of the great ironies of history: Departing from New York before the discovery of gold in California had become well known, the wooden side-paddle-wheeler stopped in Panama to pick up a few passengers on route to San Francisco. But at Panama, the ship instead found hundreds of gold-seekers waiting to board. They had made their way down the East Coast after hearing of the discovery at Sutter's Mill, and crossed the Isthmus. Upon reaching San Francisco, all the passengers disembarked for the gold fields east of Sacramento. To the captain's disdain, so did most of the crew! By a quirk of history (the Gold Rush), Pacific Mail's success was assured! 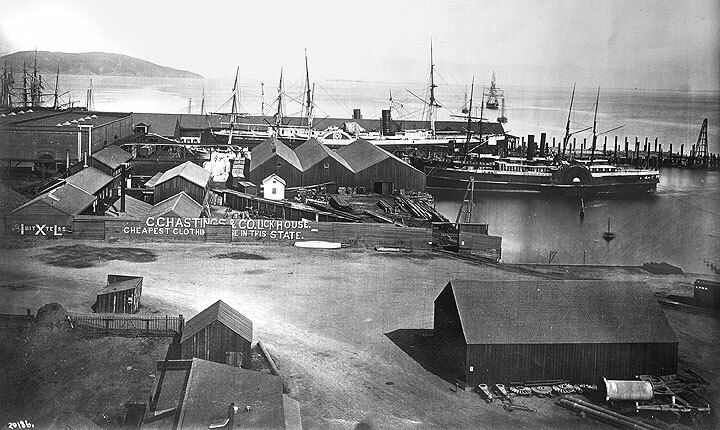 In 1867, Pacific Mail played another key role in San Francisco's development. Again supported by its U.S. mail contracts, the "mail line" launched the world's first regular trans-Pacific steamship service linking the United States with Asia. The initial route was San Francisco to Yokohama, with service to Hong Kong and Shanghai. The ships carried the fast-growing trade between East and West -- a trade that -- in our generation -- has surpassed in size even the trans-Atlantic trade that dominated America's foreign commerce since 1776. Pacific Mail also became the principal means of transport to California in the 19th Century for Japanese immigrants, and for the Chinese immigrants who built the trans-continental railroad. Both migrations vastly enriched California's economy and culture. And PMSSC was vociferous in its defense of the rights of Chinese crew members and workers. Pacific Mail transitioned into Dollar Line, also San Francisco-based, and in 1938, Dollar Line's name was changed to American President Lines (today's APL, a global container-shipping company). PMSSC in essence represents the origins of the steamship business on San Francisco Bay. But more important, the company -- born more than 150 years ago in Gold Rush days-- played a critical role in the development of San Francisco, the State of California, the United States, and the Pacific Basin. Entry taken from the website of Steve Potash at Potash Company and is used by permission. Unauthorized use of this copyrighted material or the images is strictly forbidden without permission from the author, steve@PotashCo.com. 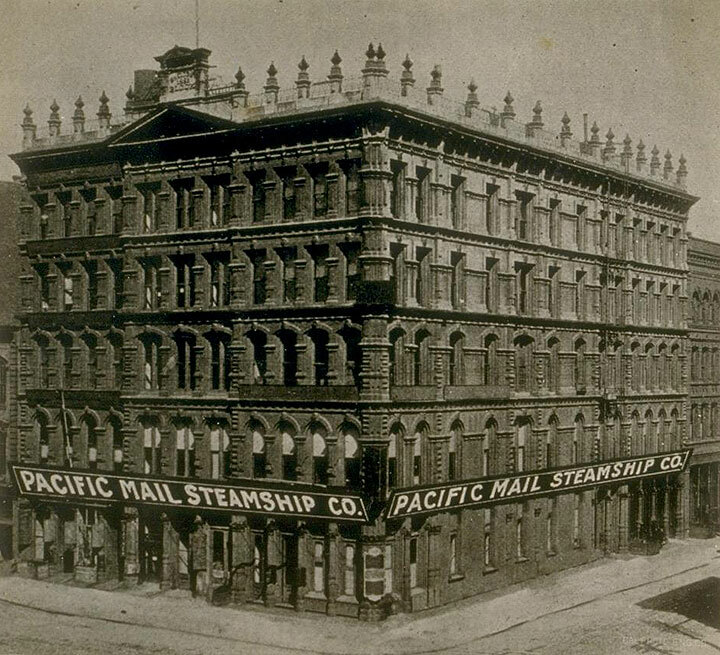 Pacific Mail Company's offices on the southeast corner of First and Market, 1896.